After dropping Jonah off at camp for the big Aquarium day, Elisabeth and I had day two of mommy-daughter time. We started of our day with breakfast at Chick-fil-a, where she got to make some friends on the playground while I read a book. Afterwards we went to the Mayfair 14 Regal Cinema for the Summer Movie Express. Regal schedules family movies in the mornings on Tuesdays and Wednesdays throughout the summer. 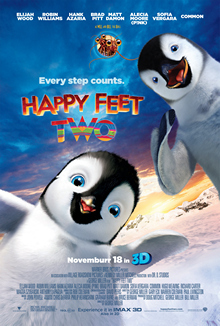 Elisabeth and I had a choice between Dolphin Tales and Happy Feet Two. We chose the latter, having already seen the first. With my Regal Card, I earned a free small popcorn which was an added bonus for Elisabeth as I was initially planning to skip it. We both had a lovely morning. The movie ended at just the right time for us to make our way over to UNC-W to pick up Jonah. When I arrived, there were only a few SeaDawgs left who were awaiting rides. Unfortunately, one of the instructors said Jonah had some trouble "listening" today - joy, joy! After hearing the details, I found it to be yet another example of why it's perhaps not a good idea to put 20 similarly aged young boys together in one room on a regular basis - this idea could not have originated from a parent! Exalting pirates may not be helpful in such an environment either!